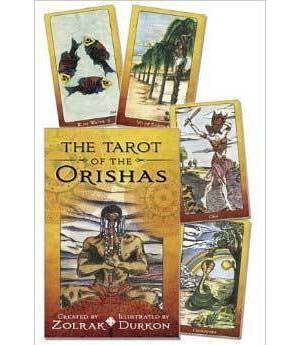 Author Zolrak, an initiate and high priest of the Candomle tradition, combines in this unique Tarot deck the ethnic and spiritual traditions of the West African Yoruba with their decedents whom are found in the religious practices of the Brazilian Candomble (people of the saint) and the Caribbean influenced practices of Santeria (worship of saints). Artist Durkon, with the guidance of Zolrak, has created a 77 card Tarot deck based on the Rider-Waite archetype. The major arcana contains thirteen Orisha cards that depict the most recognized of these supernatural beings and twelve cards representing significant symbols such as Karma, the Cuatodial Angel, and the Earth. The 52 card minor arcana contains four suits representing the elements and incorporates numerology, astrology, as well as other metaphysical aspects. The 312 page instruction book that accompanies this deck includes full descriptions of each card, layouts or spreads to use with the deck, a plethora of information on the traditions utilized in this deck, as well as tips to improve anyone's card reading abilities. Set measures 6 inches by 9 inches by 2 inches while the card stack measures 4 and 5/8 inches by 2 and 3/4 inches by 7/8 of an inch.